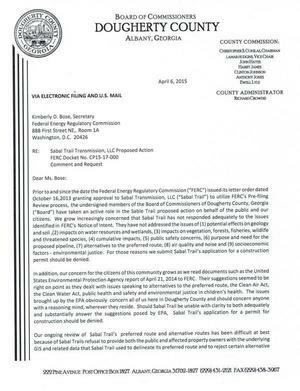 Prior to and since the date the Federal Energy Regulatory Commission (“FERC”) issued its letter order dated October 16, 2013 granting approval to Sabal Transmission, LLC (“Sabal Trail”) to utilize FERC’s Pre-filing Review process, the undersigned members of the Board of Commissioners of Dougherty County, Georgia (“Board”) have taken an active role in the Sable Trail proposed action on behalf of the public and our citizens We grow increasingly concerned that Sabal Trail has not responded adequately to the issues identified in FERC’s Notice of Intent. They have not addressed the issues of (1) potential effects on geology and soil, (2) impacts on water resources and wetlands, (3) impacts on vegetation, forests, fisheries, wildlife and threatened species, (4) cumulative impacts, (5) public safety concerns, (6) purpose and need for the proposed pipeline, (7) alternatives to the preferred route, (8) air quality and noise and (9) socioeconomic factors – environmental justice. For those reasons we submit Sabal Trail’s application for a construction permit should be denied. In addition, our concern for the citizens of this community grows as we read documents such as the United States Environmental Protection Agency report of April 21, 2014 to FERC. Their suggestions seemed to be right on point as they dealt with issues speaking to alternatives to the preferred route, the Clean Air Act, the Clean Water Act, public health and safety and environmental justice in children’s health. The issues brought up by the EPA obviously concern all of us here in Dougherty County and should concern anyone with a reasoning mind, wherever they reside. 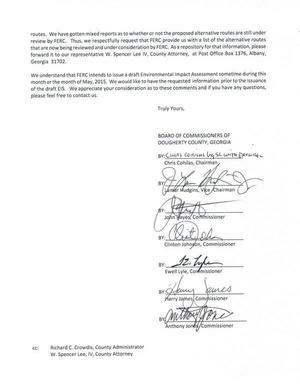 Should Sabal Trail be unable with clarity to both adequately and substantially answer the suggestions posed by EPA, Sabal Trail’s application for a permit for construction should be denied. Our ongoing review of Sabal Trail’s preferred route and alternative routes has been difficult at best because of Sabal Trails refusal to provide both the public and affected property owners with the underlying GIS and related data that Sabal Trail used to delineate its preferred route and to reject certain alternative routes. We have gotten mixed reports as to whether or not the proposed alternative routes are still under review by FERC. Thus, we respectfully request that FERC provide us with a list of the alternative routes that are now being reviewed and under consideration by FERC. As a repository for that information. please forward it to our representative W. Spencer Lee IV, County Attorney, at Post Office Box 1376, Albany, Georgia 31702.